Never pair a suit jacket with jeans. And to be honest I believe I’ve said something similar to this in more than a few of my videos at RMRS’s YouTube Channel. However, it is possible to wear a suit jacket with jeans. The key to making this happen is to understand when you can “bend” the rules. So what are those rules? Click on the video below to watch me discuss the rules on wearing jeans with a suit jacket or just read the below article. Curious as to what jeans I’m wearing in this video? Yeah, that’s right. I’m wearing Lee Jean’s modern series denim and find they make great all purpose jeans I can wear with a suit jacket. Many gentlemen only own one suit. For mant, it’s a single breasted navy blue suit with matching trousers purchased years ago for important events? So why not try to get more miles out of the jacket by wearing it with jeans? Let me be clear – if this is a jacket from the only suit you own, DO NOT wear this with jeans, chinos, or anything besides the trousers it is made to match with. The reason is having a ready to go suit (defined again as a jacket with matching trousers) is more valuable than the ability for you to wear the suit jacket as a blazer or sports jacket. If your suit jacket gets damaged or discolored you are out of the most important outfit in your wardrobe. This can happen easier than you think, as once you grow fond of the combination and end up washing the jacket more then the trousers it leads to a difference in color. You do not want to be left without a suit when you need it (unexpected funeral, wedding, special occasion) as to replace quickly can be expensive. Again – a cardinal rule of being a sharp dressed man is having a suit ready at all time for lives big events. Never sacrifice your only suit jacket for the sake of coming up with a new combination. If you really want to achieve this look, purchase a sports jacket or blazer. Short on funds? Go to the thrift store and try to find a blazer or sports coat that fits well enough for you to try out the look. Click here to see the complete info-graphic on how a suit should fit. 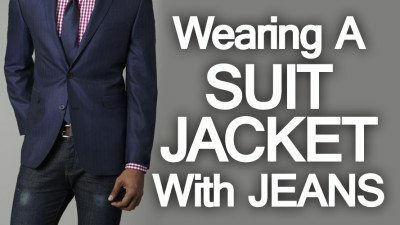 Rule #2: Does The Suit Jacket Fit? Never wear clothing that doesn’t fit well on you. A simple rule, but most men wear clothing that is one to two sizes too large. The key to good fit is know what it looks like. There is a certain way a jacket should fit- it should sit comfortably on the shoulders allowing the wearer to easily move his arms back and forth. A jacket should be free of pulling and wrinkling over the shoulders nor appear loose and baggy. If the jacket is too small or too big then do not attempt to pair it with jeans. Rule #3: Is The Suit Jacket’s Style Timeless? Proceed with caution if you’ve found a jacket straight from the 1970s. Although a great deal at the thrift store, 4 inch wide lapels went out when disco did. Look at not only the lapels (width and style), but pocket placement, length of jacket, shoulder build, button placement, and vents. Look at the Jacket to the right – the lapel widths are within classic standards, the notch lapel style is classic, the patch pocket is a bonus for use with jeans or odd trousers. Want to learn more about what goes into a classic suit jacket style – click here. Many suit jackets that men try to wear with jeans come in more fabric patterns that are non-conducive to the casual nature of jeans. Pinstripes, chalkstripes, hard colors like black. When I see a man trying to pull off this look I have to cringe as it’s like mixing oil and water – it just doesn’t work! So what colors and fabrics work well with dark colored denim? An orphaned suit jacket in solid navy blue, light gray, medium grey, true blue, flannels, small patterns like nailshead or birdseye, checks, and especially tweeds work well. Want more suit fabric ideas to wear with suits – click here to learn more! Make sure the jeans that you choose are dark, well fitted, with no signs of distress. Stay away from stonewashed jeans or denim that has a baggy or ill-fitted look. My favorite look are raw jeans in dark indigo, slightly tapered at the bottom and cut to just below the ankles. Get them hemmed if necessary. Curious as to how your jeans should fit – click here to see our infographic! Want more on how to wear jeans with a blazer jacket – click here to read our popular article. This men’s style educational guide is brought to you by my friends over at Lee Jeans. I’m wearing their modern series denim right now as I type, and find they make great all purpose jeans I can wear with a suit jacket! In summary, it can take a little hunting to find the right suit jacket and the right pair of jeans. But once you find them you have an outfit that works.